Getting ducks in a row in case I ever do finish some of the stuff I have in mind. There’s added humor in this for Mandy and I–that account has no money. All ad money goes back into advertising. 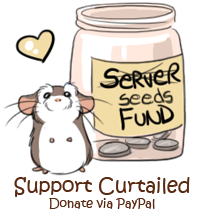 However, I will take this opportunity to thank those generous individuals who contribute donations to Curtailed–thanks for helping keep the web server running! Ah-HA! Fox’s ultimate motivation finally comes to light! He is a businessman. He doesn’t tell me what to play, and I don’t tell him what to do with his money. I’m not sure how to feel that Yay! brand makes both explosives and “cheese” dip. Does explain a few things though, doesn’t it? Yay! Brands, the successor to ACME. By the way, “PI(E) Day 2017” and “Still Can’t Handle the Proof” still have the april fools no-tailed banner on them. The banner is a php header file that loads the same for all comics. E.g. It can’t even support that option right now if we wanted it to. Your browser just needs refreshed. Huh. I thought that might have been the case so F5 and Control+F5’d before reporting it to check and it made no difference. It’s still there for PI day, several refreshes later. Strange, tho if it’s not on your end then it’s a non-issue. FYI: you don’t need to use your real email address, but it should be consistent. If it’s not the same email, your comments won’t post until one of us gets around to checking the comments for approval due to moderation rules. As for PI day still being there several refreshes later, that’s especially strange, since there is no random feature on the site anymore. We ditched it last week cuz we’d occasionally get people’s browsers doing this and we didn’t really see the value in it. More hassle than it was worth. On a whim I checked and it’s still there. Even opened it in Internet Explorer; I haven’t used IE in about a year and it’s somehow showing the no-tailed banner on Pi Day. No idea what’s going on but it seems independent of browser. Email inconsistancy is probably a typo from manually typing it. Sorry for the bother, and congrats on the 5 years. don’t want to work, just spend money ? Fox should be a politician, ’cause that’s the government all over. LOL funny! Love the expressions in the last panel! Technically a spouse can be a “co-sole proprietor” under certain conditions, I think? But still not an employee. A sole proprietorship can have employees – it just refers to how the company is managed, not it consisting of exactly one individual. Of course, if you hired fox, you’d need to pay all sorts of extra taxes, provide worker’s comp, etc, etc… the government hates small businesses. It doesn’t actually hate businesses, it just regards them as prey to be killed and devoured at will. If they’re allowed in your area, Seley/Mandy* you might want to consider being an LLC. There’s (slightly) better protection from lawsuits that way. *Now I wonder what a SeleyMander would look like. Now I wonder what a SeleyMander would look like. It would probably have something to do with setting things on fire. Like maybe Fox’s tail. I concur. It doesn’t really add any more complexity, but gives you more protections and more advantages at tax time. We’ve been running one for a couple years now, after moving from a sole proprietorship. Both when this happened in real life, and in this comic retelling, I decided that explaining the details of why my particular situation and my specific plans lends itself best to this business structure and specifically to having no employees (and all of this under advice from my CPA) would be boring and tedious. “Sole means ‘one,’ you don’t get a card” is more to the point, and easier to fit in a word bubble. So… Can we get a hint as to what you might be setting up your ducks in a row for? Is that too nosy? It’s definitely taking on a more feline appearance, isn’t it? Hmm. Fox’s comment in the last panel sounds familiar. I just can’t remember where I’ve heard it before. Oh, like it’s not being spent on the voodoo zombie-like dedication to building. I hope the master is okay; last I heard of him Fox (also, yay, avatars are back!) said he had a heart attack!